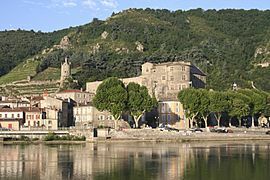 Ardèche (Occitan: Ardecha) is a département in the Auvergne-Rhône-Alpes region of south-central France. It is named after the Ardèche river. The department of Ardèche was created on 4 March 1790 with seven districts: Annonay, Aubenas, L'Argentière, Privas, Tournon, Vernoux and Villeneuve-de-Berg. 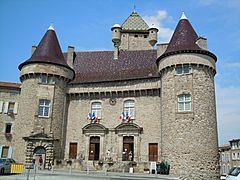 The capital was Privas alternating with Annonay, Aubenas, Le Bourg(-Saint-Andéol) and Tournon. In August of that year, the number of districts was reduced to three: Mézenc, Aubenas and Tanargue. 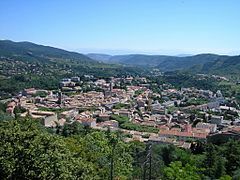 In September, Privas became the only capital of the department. In 1800, with the creation of the arrondissements in France, the three districts were changed into three arrondissements: Privas, L'Argentière and Tournon. On 18 March 1988, Tournon became Tournon-sur-Rhône. The Ardèche is part of the Auvergne-Rhône-Alpes region. It has an area of 5,528.6 km2 (2,135 sq mi). The department is surrounded by the Loire department to the north, the Isère department to the northeast, the Drôme deparment to the east, the Vaucluse to the southeast, the Gard department to the south, the Lozère department to the southwest and the Haute-Loire department to the west. The highest point in the department is Mont Mézenc (; it is 1,753 m (5,751 ft) high. The lowest point, 40 m (131 ft) above sea level, is where the Ardèche river flows into the Rhône (in the south east of the department). Loire, that flows through the western part of the department and ends in the Atlantic Ocean. Rhône, that makes the eastern border of the department and ends in the Mediterranean Sea. Ardèche, a tributary of the Rhône. The Allier river forms the border of the Lozère department and the Ardèche for about 20 km (12 mi). The Köppen climate classification type for the climate at Privas is an "Oceanic climate" (also known as Maritime Temperate climate) and of the subtype Cfb. Ardèche is managed by the General Council of Ardèche in Privas. The department is part of the Auvergne-Rhône-Alpes region. There are 3 arrondissements (districts), 17 cantons and 339 communes (municipalities) in Ardèche. The inhabitants of Ardèche are known, in French, as Ardéchois (women: Ardéchoises). 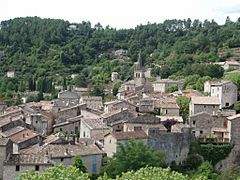 Ardèche had a population, in 2013, of 320,379, for a population density of 57.9 inhabitants/km2. The arrondissement of Tournon-sur-Rhône, with 135,088 inhabitants, is the arrondissement with more inhabitants. Ardèche Facts for Kids. Kiddle Encyclopedia.